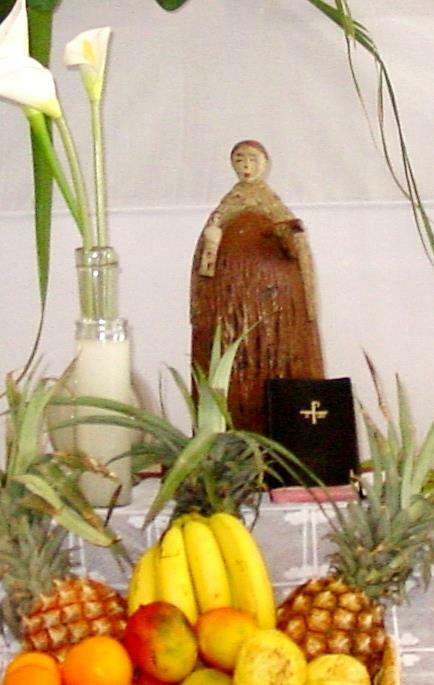 Saint Anthony is the most popular saint on Curacao. Commonly known as “Sarantonio” or “Toni”, his image or statue is richly decorated with fruits, bread and sometimes even bottles of Rum. He tends to over-promise and under-deliver and likes to have fun. He might sometimes helps you through struggles and sadness, but only if you ask nicely. According to Larry, even Jewish people ask San Antonio to help them find lost items! Thing is, Toni is known to be greedy, so he won’t always grant your wishes… So we tend to punish him by kidnapping his baby or putting him out in the blazing hot sun, facing a corner… Some even drown him. Louis Philippe remembers seeing San Antonio turned upside down until he delivers on his promises… if we could only treat our bosses and politicians this way!! !